The final years of World War II saw the legendary Panzerwaffe face its most difficult challenges, with Allied troops landing at Normandy and storming across the continent and the Russians gaining the upper hand on the Eastern Front. As Germany fought fiercely to hold on to the advantages gained in the early years, they relied heavily on the Panzer IV, the Panzer V Panther and the StuG III - the backbone of their infamous armoured divisions - to hold back their advancing opponents. 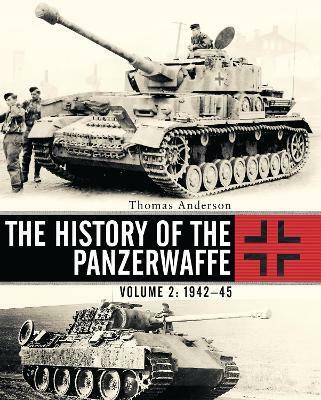 This second volume on the Panzerwaffe offers a comprehensive guide to the final years of Germany's most famous fighting force, covering the further use of the Panzer IV, the role played by the StuG III assault gun and the battlefield debut of the formidable Panther. Explosive combat reports and rare archive photographs help uncover the final years of the Panzers, from their defence against the D-Day landings and the role they played in the Ardennes Offensive to their valiant last stand in Berlin. 5 - The slow loss of Italy - The end of Panzer tactics? 6 - Russia - the weakness of a superior opponent? A German national, Thomas Anderson is a specialist on the German Armoured Fighting Vehicles of World War II. He has spent decades trawling the archives throughout Germany and the rest of Europe to discover little-known facts and never previously published photographs of the might of the Blitzkrieg. A modeller, he regularly contributes to popular modelling and historical magazines across the globe, including Military Modelcraft International (UK), Steel Art (Italy), Historia Militar (Spain) and Batailles & Blindes (France) as well as many others.